Join the discussion on our forums! Come discuss Mark of the Loa over in our dedicated Mark of the Loa discussion topic. Druid’s Mark of the Loa has nothing to do with the Druid’s Loa. Gonk what are you doing man? Gimme something I can combo you with. Flexible but not broken. Decent card. But not sure if there is room or need for this in Token Druid or not. and giving something +2/4 taunt (while mana inefficient) can protect your board too! But Saronite Chain Gang exists and is more mana efficient; giving you both 2 tokens and taunt. Maybe if it rotates out? 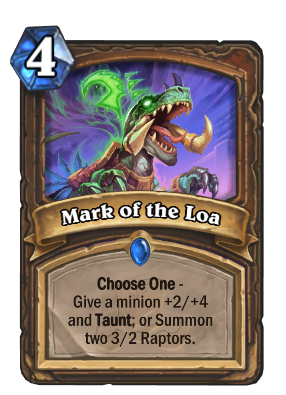 But even now, if you want +health/taunt, you can either play the cheaper Mark of the Wild or Mark of Nature. Both do not see a lot of play. If you want to summon tokens, we currently have Landscaping which has premium stats (3 mana 4/4)! Well this is also have "premium stats" to 6/4 for 4 mana (which is nice) ALSO comparing this to Mark of the Wild Mark of Nature and Landscaping is not fair because this card have something that they don't have: flexibility; yes Saronite Chain Gang is better, but this card might still see play because of the flexiblility, probably only in a few decks (Token Druid) but it's very good for Arena, because he can both make board OR upgrade a existing one. Playable, not meta, but not trash OR pack filler. Decent. Not broken, not too good. Just enough to be playable. That is actually really, really good. The second half is similarly solid on its own merits. Two 3/2s on turn 4 can threaten to trade with most five drops without breaking a sweat, and even if you're losing, your opponent will have to spent two attacks to kill this off. 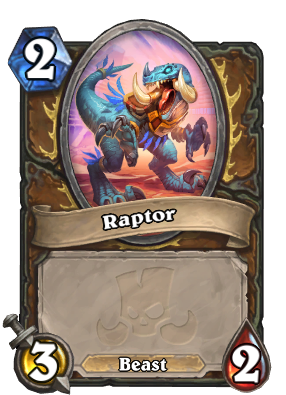 Very few removal spells can kill both raptors for less than the 4 mana + 1 card that spawned them in the first place. Either half of this card would be perfectly playable in Arena and would even have a chance of Constructed play. But when you combine them into a choose one card, they compliment each other perfectly. When you have a wide board, summoning two raptors borders on overextending, but giving a minion +2/+4 can make your board sticky enough to take a board clear without losing steam. When your board is empty, giving a minion +2/+4 isn't terribly useful, but summoning two raptors puts your opponent right back on the defensive. Conclusion: One of the best cards in the set. (Not usable in Combo Druid though.) Token Druid will bend over backwards to find space for this card. flexible yes, but as of now we don't really have a lot of good 3-drops in druid that curve into this, and I don't think running two Bloodfen Raptors packaged into a single card is something Druid really wants or needs. At least not as long as Chaing Gang and Oaken Summons is still in Standard. Even after the rotation I don't think this would see play unless we get a whole bunch of really good 3-mana buff targets. Annoy-o-Module without divine shield for any minion or Worgen Greaser split in 2 bodies and with 1 extra HP. Interesting card but i don't think it it may see much play... Guess in arena it may be useful.